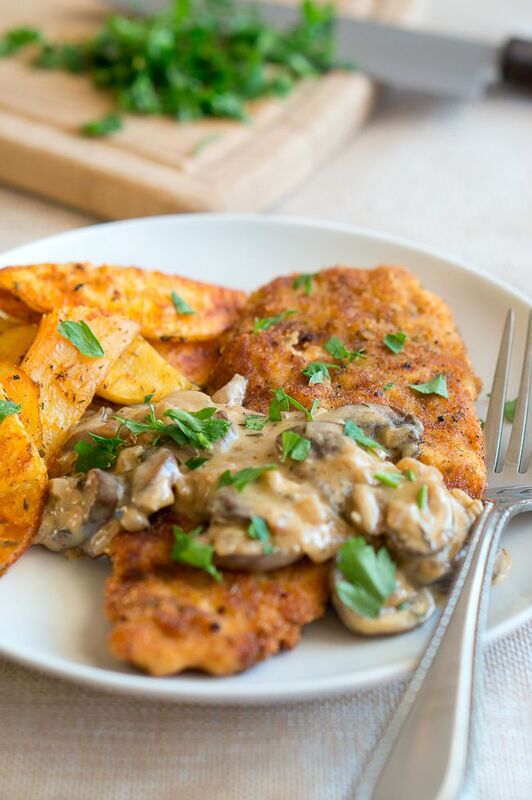 Today, I am sharing with you my favorite recipe for German Schnitzel which I revived from the archives. It’s the same tried and true recipe for gluten free Schnitzels, I only took new pictures. I wanted to share with you this easy recipe for German Schnitzels since it’s Oktoberfest season in Germany. This meal is perfect for a quick and delicious weeknight dinner! 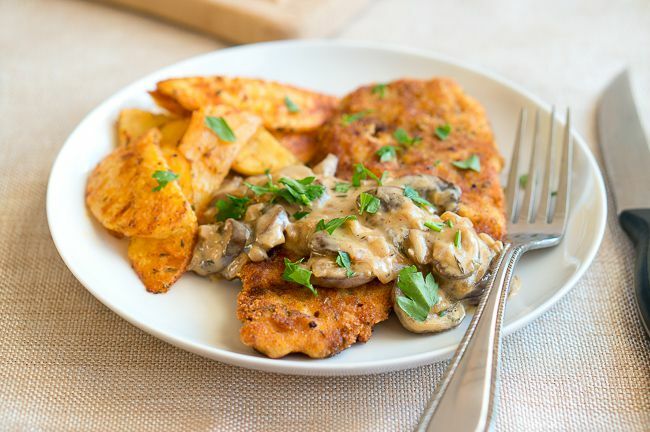 In a previous post, I shared with you, my recipe for Pan Fried Potatoes since my husband requested Pan Fried Potatoes and Schnitzel for his birthday earlier this year. They go wonderfully together! Schnitzel in German means “cutlet” which is usually made with veal, pork, turkey or chicken. It is thinly pounded cutlet, breaded and fried. Did you know that Schnitzel comes from Austria? Yes, Wiener Schnitzel! Even though it’s a traditional Austrian meal, it is very popular in Germany and Switzerland as well. I traveled several times to Austria when I used to live in Europe, and have tried many different types of Schnitzel. Luckily, there is a very nice German restaurant in our town called Ol’ Heidelberg which offers a variety of German meals and … yes, you guessed it, Schnitzels. 🙂 I love their food and it always reminds me of my college years in Germany. As for this recipe, it is made with thinly pounded chicken breasts. Those of you looking for a quick weeknight dinner will love this one. Pound each boneless chicken breast to about 1/4 inch thickness. Season generously with salt and pepper on both sides. Place the almond flour, the whisked eggs and the gluten free bread crumbs in three different dishes (plates or bowls). Heat the olive oil in a large skillet over medium-high heat. Dredge each thinly pounded chicken breast in almond flour, tapping off any excess flour, then dip each one in the bowl with the eggs, and then coat well with breadcrumbs. Saute first two chicken breasts for about 3 minutes on each side until they are golden brown. Remove the Schnitzels from the skillet and cover with a foil to keep warm while you prepare the rest of the Schnitzels. Add onion and garlic to skillet and cook for a couple minutes until onion is translucent and soft. Add mushrooms and stir. Season mushrooms generously with salt and pepper. Let cook for about 5 minutes, stirring occasionally. When mushrooms are cooked to your liking, add wine and half & half and cook the sauce for about 6 minutes until it reduces a bit and thickens. It will thicken more when it cools. Mmm, just looking at these pictures makes me hungry again. 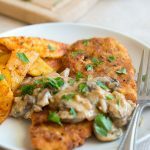 Surprise your loved ones with these appetizing Schnitzels for supper and let me know how you like the recipe. 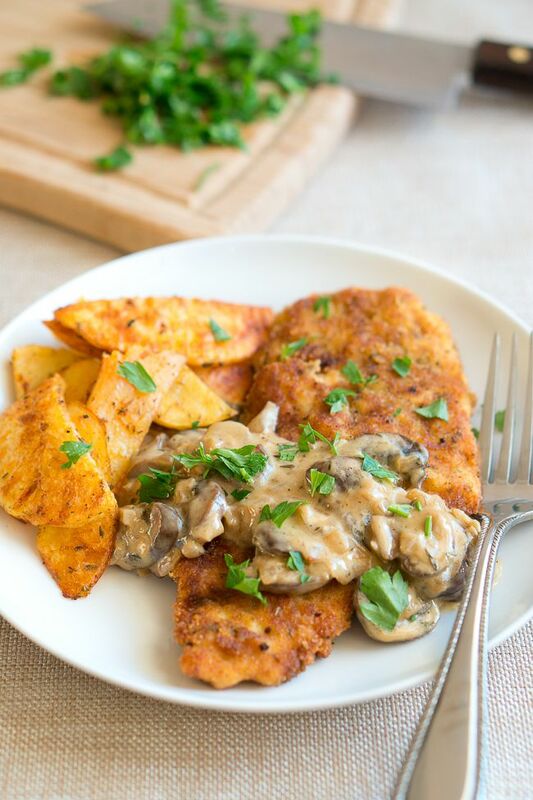 Gluten Free German Schnitzel with mushroom gravy is wunderbar! Tender & juicy chicken cutlets fried to crispy perfection. Only 30 minutes. Pound each boneless chicken breasts to about 1/4 inch thickness. Season generously with salt and pepper on both sides. Place the almond flour, the whisked eggs and the gluten-free bread crumbs in 3 separate flat dishes. Heat the olive oil in a large skillet over medium high heat. Dredge each chicken breast in almond flour, tapping off any excess flour, then dip each one in the bowl with the eggs, and then coat well with breadcrumbs. When mushrooms are cooked to your liking, add wine and half & half and cook sauce for about 6 minutes until it reduces a bit and thickens. It will thicken more when it cools. The potatoes & mushroom gravy are optional side dishes. They are not Paleo. The nutritional information for the white wine sauce is not included in the recipe card. This looks like the perfect weeknight dinner. Will definitely be trying. I haven’t had a schnitzel in years and this one looks wonderful. 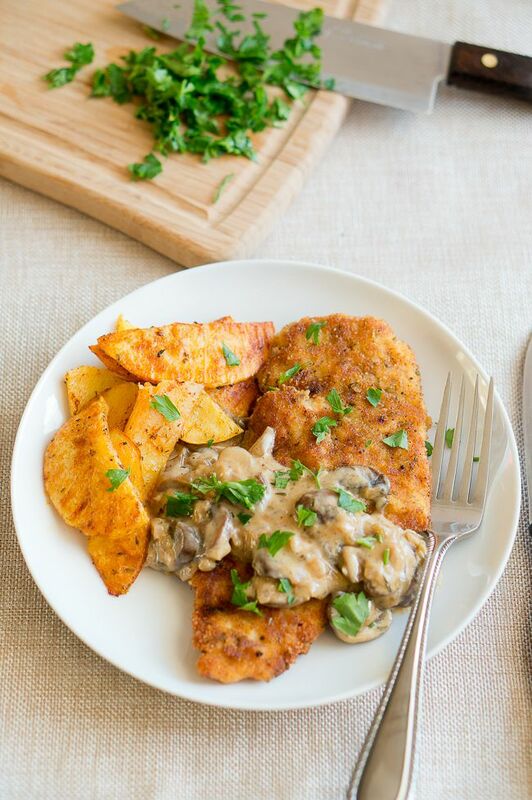 I make a Paleo schnitzel all the time with almond meal! It’s delicious topped with some sauerkraut too! Gluten free schnitzel! I’m going to have to spend some time sans-gluten this fall, so I’ll definitely add this recipe to my menu! My mouth is WATERING! Pinnning! Doesn’t the half and half make it non-Paleo? I recently updated the pictures of this post and added the mushroom gravy recipe. The original recipe is for the Schnitzel which is Paleo. 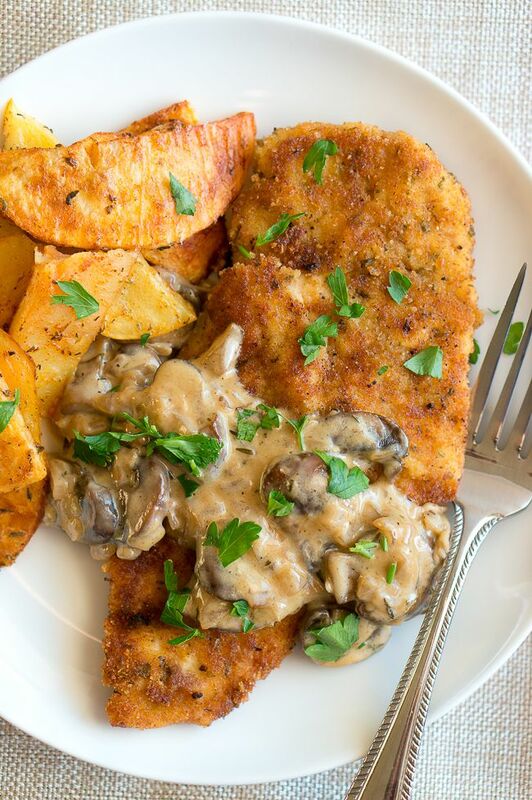 You are welcome to make the Schnitzel without the mushroom sauce. Hope you enjoy it! Thanks makes sense …. I’ll try it with almond milk tonight instead. Can’t wait!! Thanks! 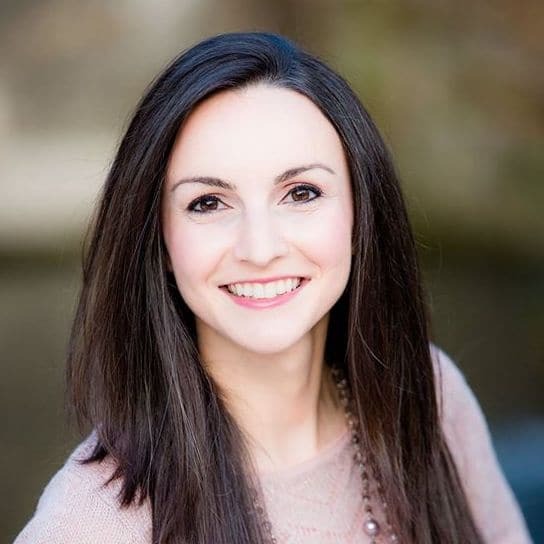 My daughter is also allergic to nuts so can not use almond flour.Could I substitute corn starch?? Hi Linda, I haven’t tried to use corn starch for this recipe. It might be a good substitute. Also, coconut flour might work as well. Sometimes I use gluten free bread crumbs, and it turns out great. Hope this helps! The potatoes in the picture are different than the ones in the link. Do you have a recipe for the ones pictured here? Thanks! They are only sliced differently but they are seasoned and baked the same way. I will probably post a separate recipe sometime soon showing the exact same potatoes in the picture. Can you tell me what half and half is supposed to be? Just a bit confused. It’s heavy cream. In German, it’s ‘Schlagsahne’ (unsweetened). But this is only needed if you want to make the mushroom sauce, it’s not needed for the Schnitzel itself.